Electronic Areas are usually installed with ESD (Electro Static Discharge) Flooring which is a term for a floorcovering that has anti-static, non-porous and conductive capabilities. These kinds of floorings control and reduce electrostatic charges for a safer working environment. 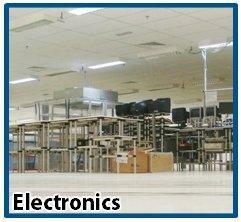 ESD floors play a crucial role in working spaces that are exposed to dangerous voltages. These floors work to prevent human body voltage and equipment damage. High Performance Solutions, Inc.(HPS) specializes in ESD Control flooring installations for areas and facilities that require static discharge protection. Our products are equipped with the appropriate ESD and conductive properties that meets ESD standards.